The foundation of Democrat Ilhan Omar’s historic primary election win to represent Minnesota’s 5th District in the U.S. Congress was built on a simple campaign message. “I am a millennial with student debt,” the 35-year-old state lawmaker told an audience in a crowded auditorium at the University of Minnesota’s Hubert Humphrey School of Public Affairs during a pre-election forum with two of her competitors, both of them older. “And a renter,” she added, someone who isn’t ready, or can’t yet afford, to purchase a home. It was a simple yet effective message by Omar, conveying that — despite her origins in Somalia and the hijab upon her head — she was just like the many younger, progressive and liberal voters she needed to court in the Congressional district she seeks to represent. It was ultimately a winning message, both now… and two years ago when she first made history in her election (which her campaign says saw increased voter turnout by 37 percent) to the Minnesota state House of Representatives. Mohamed is just one of the tens of thousands of Somali Americans who voted on this primary election day for Ilhan Omar, who is one step closer to making history as the first elected refugee from the African continent — and the second Muslim American woman — to join the body. She follows in the footsteps of Keith Ellison, the first Muslim American in Congress, who currently represents this Minneapolis Congressional District, but stepped down to pursue the state’s Attorney General’s office — an election which he too also won the same night as Omar. “Around America it might seem odd that one of the whitest states in the country would be sending its second Muslim to Congress,” says University of Minnesota Professor Larry Jacobs. “But not so in Minnesota,” a state that is home to the largest number of Somali refugees in the United States. But Jacobs says their votes are only part of Ilhan’s success story. New voices that have new — and old — challenges to face. Khalid Mohamed agrees with Omar’s policy positions, and hopes her personal experience coming from a Kenyan refugee camp will shape the ongoing debate in Congress over U.S. immigration policy. 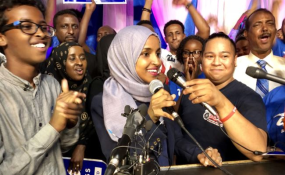 Many in Minnesota’s Somali Muslim American community are refugees like her, and Omar’s election represents an opportunity to change public perceptions — and misperceptions — about their circumstances, and their faith. Mohamed also believes that Omar’s election sends a message of hope to not just a larger religious community, but an entire continent. Work that begins for Omar after a November general election that she is also likely to win, as the district she seeks to represent heavily favors Democratic candidates.